Even a decade ago, the year I studied in the city of Bologna, Italy, I fanatically sought out unknown fruits and vegetables. For a nineteen-year old Americana, porcini mushrooms and white truffles were a sight to see in the fall. Marble sized clementines in the winter, white asparagus and rapini in the spring, and strange spotted beans in the summer dazzled me. The oh-so-common (to Italians) and humble borlotti bean, with its fiery pink-red pod and dappled white spots was exotic to me. 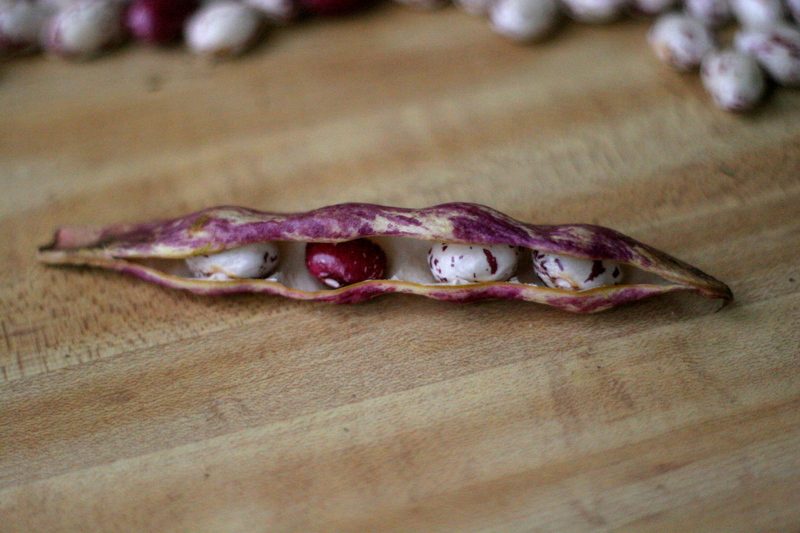 I had never seen such a beautiful shelling bean at any of the California farmer’s markets that I frequented. 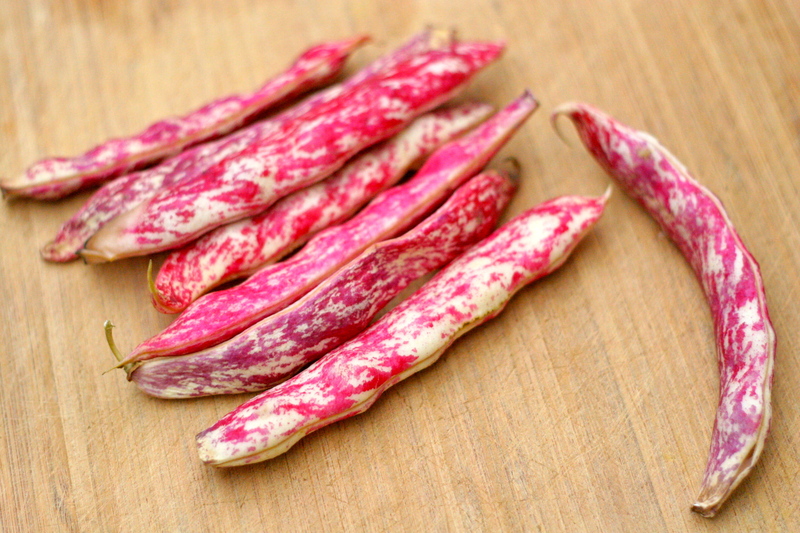 Tongue of fire beans or "borlotti"
Like any fresh shelling bean, a quick cook in lightly salted water is all it needs. In Italy, this is the most common bean in minestre (mixed soups), beans and pork, and aside beautiful cuts of meat and maybe a spoonful of Piemontese polenta. The bean itself is sumptuous. 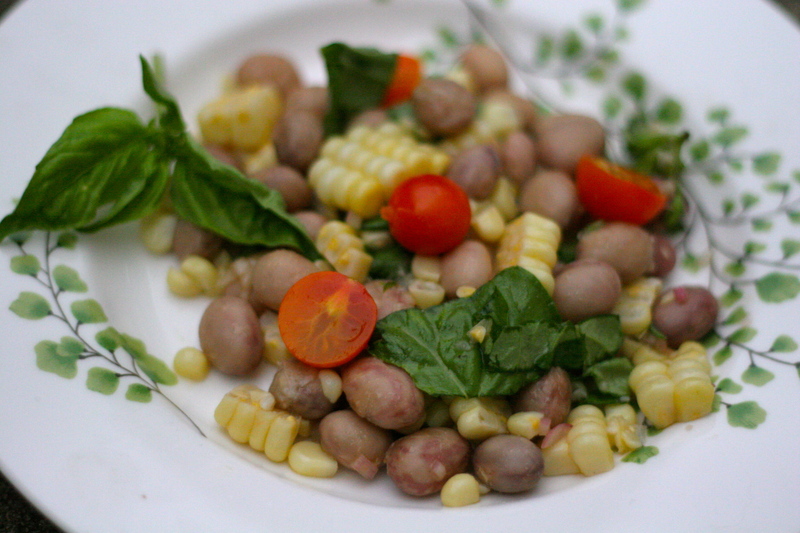 It has a meaty, almost bacony flavor, and an incredible texture that is utterly irresistible in my corn and bean salad. The bean does not mush apart when cooked but stays in its outer covering until you bite into it and taste the silky and smooth inside. Hands down, it is my favorite bean. This salad always begins with the beans and some sweet corn, but I vary the rest of the ingredients depending upon what I have at hand. My favorite rendition also uses slivered basil, sungold tomatoes, shallots, and a simple olive oil-sherry vinegar dressing. The cake is inspired by a favorite fall cake by Deborah Madison from her timeless Vegetarian Cooking for Everyone. I have had an almost decade long adoration of the cake because of its seasonal versatility and simplicity. If you like the flavor of frangipane, almond croissants, macarons, and the like, you will have a hard time keeping your hands off of this cake. Select almost any fruit (apricots, peaches, plums, cherries, pluots, apples, pears, persimmons, candied citrus) and your favorite nut. I use walnuts, hazelnuts, or almonds depending upon how they pair with the fruit. With the exception of your mixing bowl, you can cook the whole thing in an oven-safe 9- or 10-inch frying pan. Simply melt the butter (and I confess sometimes to using brown butter on this one) with the brown sugar until it bubbles, arrange the fruit slices, and then pour the cake batter on top before popping it into the oven. I like mine just barely done, such that a toothpick comes out clean everywhere except the very center of the cake. 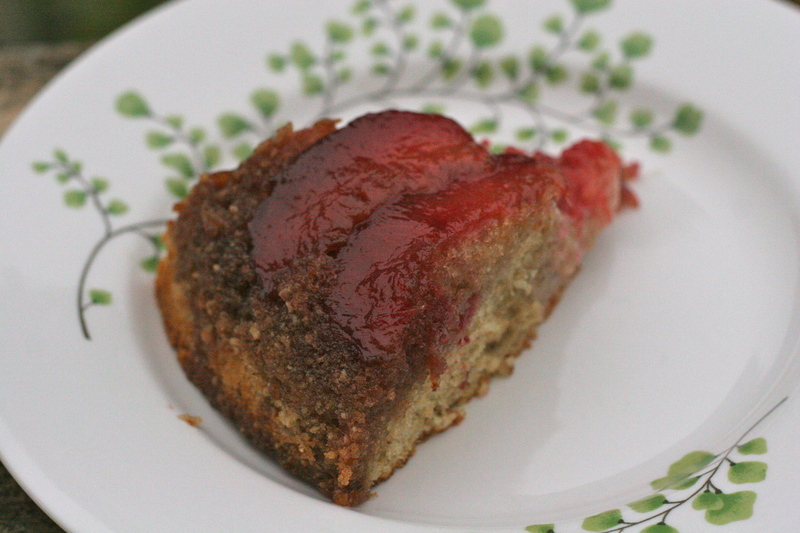 It keeps a lovely moistness that heightens the nutty flavors of the cake. The only tricky part of this cake is flipping it onto a cake plate once it is finished cooking. If you are a champion flipper with an assured and deft hand, you need not worry. 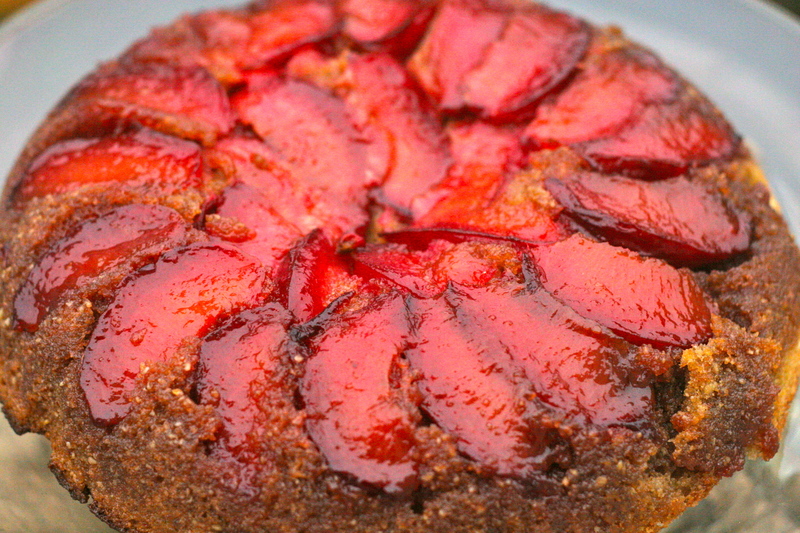 For the rest of us, a piece of fruit or even a tiny part of the cake may stick to the pan. No worries. Just scrape it out and carefully press it back into the cake as it cools. Serve it naked or with whipped cream spiked with creme fraiche. If you are like me, you will modestly eat three slices and then more for breakfast the next day. Place the two ears of corn in water and bring to boiling. Turn off heat and then cover for 10 minutes while you shell the borlotti beans. Remove the corn and set aside and then, if you want to use the same water, bring back to boiling and add the beans. Cook until they are tender, but not falling apart. Drain, rinse roughly with cold water, and set aside. While the beans are cooking, whisk the vinegar and salt with the shallot in your serving bowl and let stand for about 5 minutes. Slice the larger tomatoes in half and leave the smaller ones whole and then add them to the shallot mixture. When the beans are done and cooled slightly, add them, along with the olive oil to the bowl, tossing well. 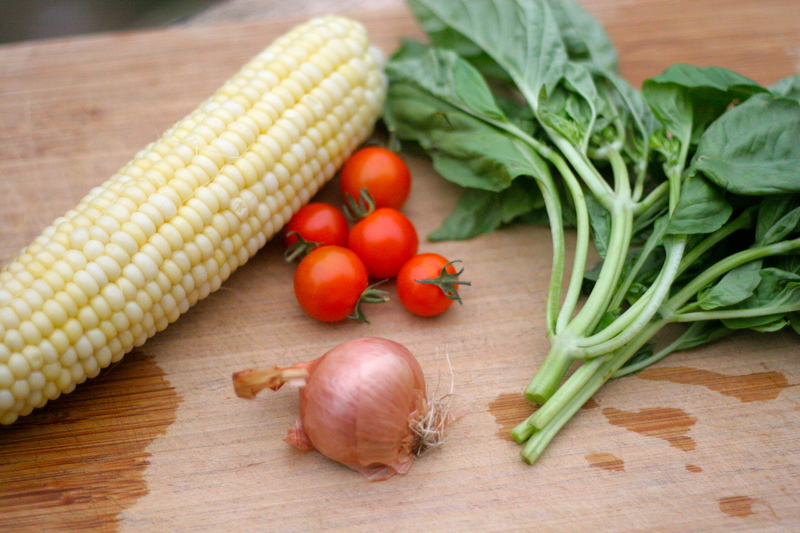 With a sharp knife shave off the corn kernels and add them, tossing gently, followed by the slivered basil. (You can stack the leaves of basil, roll them like a cigar and then slice thinly). Check if you need more salt and then serve. Preheat the oven to 375F degrees. Heat the brown sugar and butter in a 9- or 10-inch oven safe skillet over medium until it is all melted and bubbling slightly. Take off of the heat. 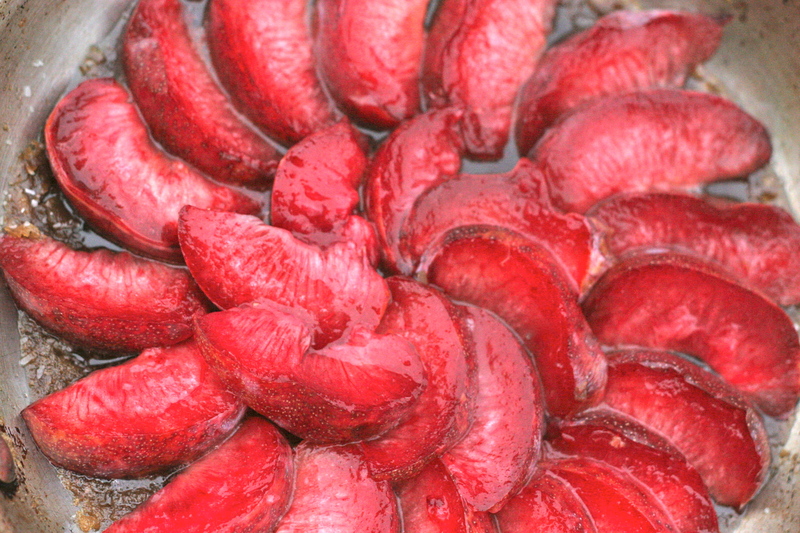 Slice the pluots in half from stem to bottom, remove the pit, and then slice each half lengthwise to make 1/4 inch thick pieces. Arrange the slices in the pan in concentric circles, overlapping slightly, and beginning with the outside (you can also do a spiral, snail-shell thing). To make the batter, cream the butter and sugar until light and fluffy, and then add the vanilla and almond extracts. (I often end up doing this in the Cuisenart because I have just used it to grind up the nuts.) Beat the eggs in, one at a time, stirring between additions, and then fold in the nuts, followed by the rest of the dry ingredients. Carefully spoon the batter over the fruit and smooth it out. Bake in the center of the oven for 35 to 40 minutes until the a toothpick comes out clean on the outside and the cake is mostly golden and springy (see above note). Remove the cake from the oven, being careful to not grab the handle of the skillet pan out of instinct with your bare hands (it is embarrassing to admit how many times I have done this), and allow to cool for 2 minutes. Place a flat plate or cake plate on top of the pan and quickly and confidently flip the cake onto the plate. If any part of the fruit or cake stays in the pan, just remove it and stick it back on the cake. Let cool for another 10 minutes or so, or let cool to room temperature. Delicious plain, with whipped cream, or with whipped cream spiked with creme fraiche. This entry was posted in Almonds, Cakes, Nuts, Rustic Fruit Desserts, Vegan, Whole Grains and tagged basil borlotti corn tomato recipe, borlotti bean salad, corn and borlotti bean salad, pluot almond cake, pluot cake, tongue of fire bean salad, whole wheat almond cake, whole wheat pluot almond cake, whole wheat pluot cake. Bookmark the permalink.